A picture paints a thousand words. Photo from today's CAPA meeting, with the Archbishop of Canterbury Rowan Williams on one side of Uganda Archbishop Henry Orombi and CAPA Chair Ian Ernest of the Indian Ocean and the Archbishop of the ACNA Bob Duncan on the other. The Anglican church in the West no longer adheres to the word of God, African bishops said Tuesday at a continental conference attended by the Archbishop of Canterbury. 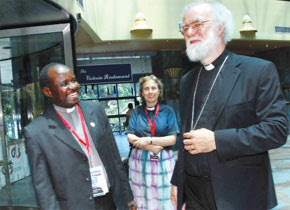 Rowan Williams, the head of the world-wide Anglican Communion, has been criticised by some African church leaders for his tolerant stance on homosexuality. "Today, the West is lacking obedience to the word of God," Reverend Ian Ernest of Mauritius, the head of the Council of Anglican Provinces in Africa, told journalists. "It is for us (Africans) to redress the situation," he said, adding that he has severed all ties to the Episcopalian churches in Canada and the US that have allowed gays to enter the clergy. The conference host, the Archbishop of Uganda Henry Luke Orombi, said African leaders would use the six-day meeting to voice the concerns about the "ailing church" to Williams. "Homosexuality is incompatible with the word of God," Orombi said. "It is good (that) Archbishop Rowan is here. We are going to express to him where we stand. We are going to explain where our pains are." Orombi also said that disputes over homosexuality had already divided the global Anglican community. "There is already a break. It doesn't need to be announced. It is in the way people act," he said. Williams delivered a sermon Tuesday during the opening of the meeting, the first of its kind since 2004. While he did not mention homosexuality, he said it was the duty of all bishops to be open minded on contentious issues. "We must learn to listen to those we lead and serve to find out what their hopes and needs and confusions are. We must love them and attend to their humanity in all its diversity," he said. "We cannot assume we always know better and that we always have the right answer to any specific question." Word out is that the President of Uganda had some interesting things to say to Rowan Williams in his opening address of the Council for Anglican Provinces of Africa conference in Entebee, Uganda. The Archbishop of Canterbury has all ready addressed the convention this morning. 400 African bishops (and western lobbyists) will gather at the Imperial Resort Beach Hotel for the second major gathering of the Anglican bishops of Africa. The first gathering was held in Nigeria in 2004. “It is interesting that we are having the second African bishops conference in Uganda just after the African Union summit," said CAPA general secretary, the Rev. Canon Grace Kaiso in early reports. "Those of us who believe in God think this is a message in terms of the privileged place Uganda occupies on the continent,” he said. “We cannot have a prosperous future when the greater part of our population is under war, disease and our population is merely surviving. We are saying as the church who believe in the fullness of life, things must be done differently. We are here to reflect together on how we can tackle some of these bottlenecks of perpetual conflict, poverty and disease,” Kaiso told the press. Of note, The Episcopal Church has shown up in full force this time. AnglicanTV is present at the conference and we'll be bringing updates - stay tuned! Archbishop Zelig, your taxi is waiting. and by Zelig, I meant Duncan.